Discussion in 'Classic Muppets' started by ploobis, Oct 19, 2011. Since it's Halloween time, who are your favorite Muppet Monsters? 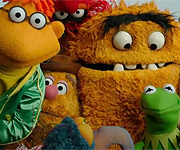 Now who are your favorite Muppet Monsters? 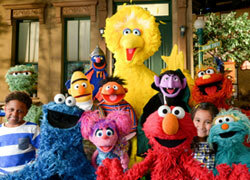 if you wanna name Sesame Street Monsters here too thats ok. I'm a Beautiful Day Monster kinda guy, but I love them all. Doglion has my favorite name. Sweetums, Uncle Deadly, and Thog are my top 3. They have so much personality. Thog is so CUTE, and Sweetums is so sweet. Uncle Deadly is probably the funniest antagonist a Muppet's ever faced. Lunch Counter Monster, Carl, and Beautiful Day are the most appealing to me largely because of how they look...I mean, ALL monsters act growly and eat everything! However, I think Sweetums and Carl have the most enjoyable (if that's an applicable term here) personalities! My top four would be: 1. Thog.... Ive loved him since I was a kid. I'm so happy to know he's featured in the new movie! 2.Uncle Deadly..... he's just awesome. Enough said! 3.Sweetums.... he cracks me up. 4. Beautiful Day Monster.... mainly for the skit with Paul Williams on TMS. "Got anything cheaper?" Other than Behemoth, I really like the Luncheon Counter Monster, Gorgon Heap, and Big V.
I know I haven't posted in a while, but I would like to say how happy it makes me that Deadly has been getting so much love lately... He's my favorite Muppet, and the fact that he's been featured so much in recent projects really makes me smile! LaRanaRene and MikaelaMuppet like this. When I say I'm a huge Muppet fan that can name pretty much any obscure Muppet. I ain't lying. That is some obscure stuff right there, ask your average Joe off the street and he wouldn't know what the heck your talking about.